I'm going to continue this idea of pulling out an item and making something out of it. At the moment it's a bit heavy on the Pull side. This is because 1) I like the Pulls (I have them on my purses, I list them in my shop and I give them to friends) and 2) I'm creating a stand and will bring them to the Palmer Art Market in June, so need to build up a good number in case others like them as well. 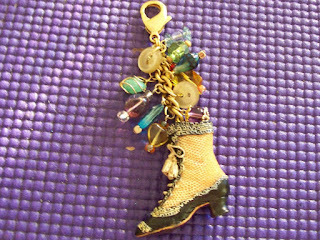 Pulled open the drawer, reached in and the packet that was pulled out contained a set (6) of victorian era shoe ornaments. I think they were probably Christmas Tree Ornaments as each have a small ribbon attached. Removed the ribbon, and attached the shoe to a small piece of chain and a lobster clase. 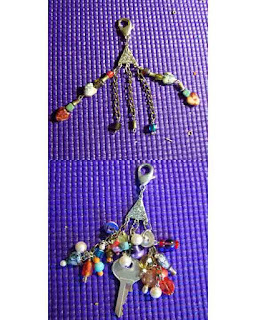 I decided to use 'already made' bead sets (I frequently have bead sets left over when creating something; these I toss into an 'extra' box for future use) and a few buttons. Instead of the drawer, picked up a piece that was sitting on the side table. Now this is a Pull that I created a year or so ago ... among the first. It's funny how these firsts are. You make it and you think it's wonderful ... and then, sometime later, you start to realize how not-wonderful they were. I think I listed this on Etsy and when it didn't sell after the 4 months, it found its way to my side table. Well, in looking at it, I can see full well why it didn't sell. But, that's always the lesson to remember ... Just because I made it doesn't necessarily mean its of value. Anyway, I still like the idea of using the 3-prong earring base with chain and the lobster claw. I took the rest apart. I decided to add in a key (must have several hunderd keys now), and a number of the already bead sets. AND ... DRUMROLL ... this Pull is recreated and I hope it will, one day, be loved by someone.